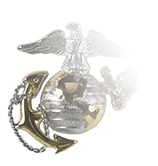 Article 3501.87 of the United States Navy Uniform Regulations authorizes Officers and CPOs to wear a gold tie tack or tie clasp decorated with “appropriate insignia to which the wearer is entitled.” For more than 40 years, that has included the Surface Warfare Officer insignia, first approved in 1975 and then augmented by the Enlisted Surface Warfare Specialist insignia in 1979. 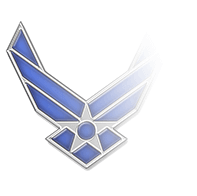 The Surface Warfare insignia can be worn only by those personnel who have completed the Surface Warfare qualification. 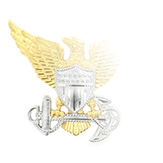 Both the Officer and Enlisted versions of the insignia feature a head-on view of a modern warship set against a backdrop of ocean swells, but the Officer’s insignia is distinguished by the two crossed swords behind the vessel; the Enlisted version features cutlasses instead of swords. 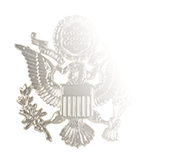 Our Surface Warfare Officer tie tack/clasp is manufactured all in gold with the Officer insignia, while the CPO tie tack is manufactured in gold (per Navy regulations) but is surmounted with a silver Enlisted Surface Warfare Specialist insignia. 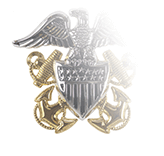 We also carry an Enlisted version of the Surface Warfare tie tack/clasp to reflect the fact that four-in-hand ties were worn by Sailors in the E-1 to E-6 rates with the Winter Blue uniform (Article 3423, NAVPERS 15665I, January 1998).